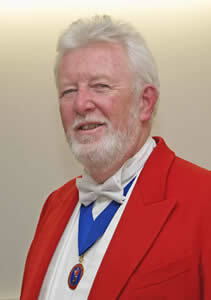 Terry Hughes, who is a resident of Gloucestershire, is a Professional Toastmaster and Master of Ceremonies. Whatever your occasion Terry will guide you and your guests through your day with a sense of humour and dignity. Terry is able to advise on all aspects of protocol and will assist you through the planning and preparations of your event. As a member of the English Toastmasters Association Terry is bound by a strict Code of Ethics, thus enhancing your occasion with professional and ethical behaviour.